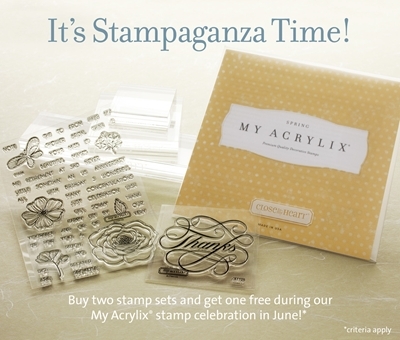 Carla Creates: It's CTMH Stampaganza Time!! Everyone's favourite CTMH stamp sale is back!! Pull out your stamp set wish lists - - - now is the time to stock up! All of our stamp sets are 'buy two, get one FREE'!! You can order any stamp set from the Spring/Summer 2012 or Fall/Winter 2011 Idea Books! Notes: Stamp sets available for FREE include A, B, C, D, and E-size sets only. Customizable (K), Workshops on the Go™, Cricut® collection, and Stamp of the Month are not available as free sets. Stamp sets that count toward the qualifying purchase include full-priced A, B, C, D, and E sets only. Stamps that do not count toward a qualifying purchase include customizable (K), Workshops on the Go™, Cricut®collection, and Stamp of the Month sets (both discounted and full-priced). This offer is good from June 1st to 30th -- shop online on my WEBSITE or send me an EMAIL with your order! (When shopping online, simply add all of your stamp sets to your cart and the system will automatically calculate which set is 'free'). And don't forget -- when your order reaches $50, you can also add this month's Stamp of the Month, "Life is Tweet" for just $5! !